A stereo setup assumes that the listener is physically located between the speakers, that’s how it can deliver sound equally from both sides. It’s also why the receiver has a “Balance” adjustment, so the listener can virtually move the center point of the audio by changing the relative volume of the speakers. You should set your speaker balance so that your normal sitting location is centered, but of course you might not always be in that same position every time you listen to music or watch something. [Vije Miller] writes in with his unique solution to the problem of the roving listener. He’s come up with a system that can adjust the volume of his speakers without having to touch the receiver’s setup, in fact, he doesn’t have to touch anything. 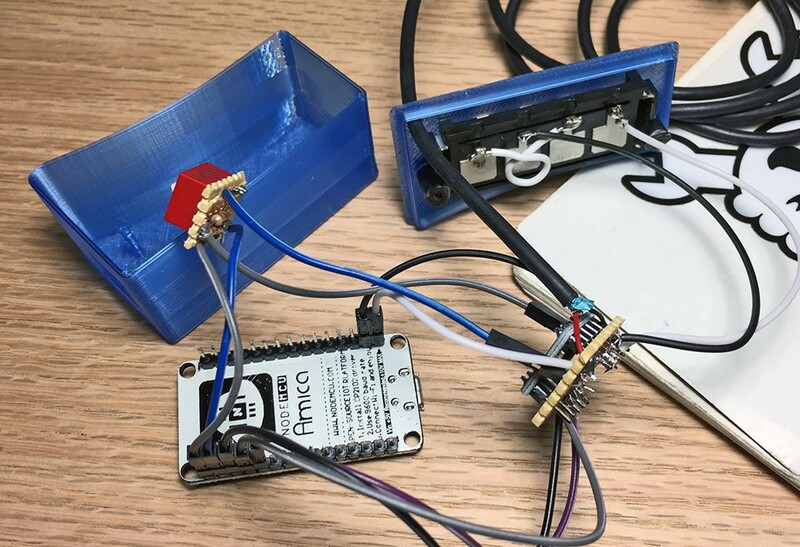 By leveraging configurable voice control software running on his computer, his little ESP8266-based devices do all the work. Each speaker has its own device which consists of a NodeMCU ESP8266 and X9C104 digital potentiometer inside of a 3D printed case. The audio terminal block on the gadget allows him to connect it inline between the speaker and the receiver, giving [Vije] the ability to adjust the volume through software. The source code, which he’s posted on the Hackaday.io project page, uses a very simple REST-style API to change speaker volume based on HTTP requests which hit the ESP8266’s IP address. The second part of the project is a computer running VoiceAttack, which lets [Vije] assign different actions based on what the software hears. When he says the appropriate command, the software goes through and fires off HTTP requests to the nodes in the system. Everything is currently setup for two speakers, but it shouldn’t be too difficult to expand to more speakers (or even rooms) with some adjustment to the software. It’s not the first voice controlled speaker we’ve ever seen, but it does solve a very specific problem in a unique way. We’d be interested in seeing the next logical step, which would see this technology integrated into the speaker itself. Many of us have aspirations of owning a tube amp. Regardless of the debate on whether or not tube audio is nicer to listen to, or even if you can hear the difference at all, they’re gorgeous to look at. However, the price of buying one to find out if it floats your boat is often too high to justify a purchase. [The Post Apocalyptic Inventor] has built a stereo tube amplifier in the style of the Fallout video games. The idea came when he realised that the TK 125 tape recorder manufactured by Grundig was still using tube audio in the late 60s. What’s more, they frequently sell on eBay for 1-10€ in Germany. [TPAI] was able to salvage the main power amplifier from one of these models, and restore it so that it could be re-purposed and see use once more. The teardown of the original cassette recorder yields some interesting parts. Firstly, an integrated motor transformer — an induction motor whose stator acts as the magnetic core of the transformer responsible for the tube electronics. There’s also an integrated capacitor which contains three separate electrolytics. The video after the break is well worth a watch (we always find [TPAI]’s videos entertaining). A new chassis is created out of a steel base plate and aluminium angle, and some neat frames for the motor transformers are made from scrap copper wire bent and soldered together. It looks great, though there’s always the option to use a cake tin instead. If you’re interested in the design of tube amps, we’ve covered heaps of cool builds: from this low-voltage design to this tiny guitar amp, or even ones using tubes which are flat. Reading an article about the first transistorized Hi-Fi amplifier, [Netzener] got the itch to make one. But what to use for the starting point? Enter an old Radio Shack P-Box stereo amplifier kit. After a few modernizations and tweaks, the result is an 8-transistor stereo amplifier that’s aesthetically pleasing, sounds great, and is fully documented. The Radio Shack kit used germanium transistors, but with their high leakage current and low thermal conductivity, he decided to convert it to work with silicon transistors. He also made some improvements to the push-pull bias circuit and limited the high-frequency response. As for the finished product, in true [Netzener] style, he assembled it all to look like the original completed Radio Shack amplifier. He even wrote up a manual which you’d think, as we did at first, was the original one, giving that old, comfortable feeling of reading quality Radio Shack documentation. Check out the video below where he uses a 9 V battery and half a watt per channel to fill a room with clear, stereo sound. This isn’t the first Radio Shack kit that [Netzener] has adapted. Check out his single tube radio and classic neon “Goofy Light” box. If you are a devotee of audiophile-quality analogue hi-fi, switching between sources simply can not be done through a solid-state device. Only physical switches will do because they come without the risk of extra noise or distortion that their silicon equivalents might bring. That is the philosophy that lies behind [Skrodahl]’s relay-based audio switching board, which boasts 5 high-quality relays each handling a stereo input, with their control passed either to a rotary switch or to an ESP32 module. The ground connections on audio and switching sides are isolated from each other to avoid transient noise finding its way to the speakers. You might think that an audio switching board is a very simple device indeed and thus not worthy of Hackaday’s attention, but it’s surprisingly easy to make a mess of a module like this one and they have put in some effort to avoid the pitfalls. The metal-can version of the switching transistors seems a little overkill, but fancy audio is a funny business. If the ESP isn’t your bag, we’ve brought you another relay based audio switcher in the past that used an Atmel chip. The 20th century saw some amazing technological developments. We went from airplanes to the moon. We went from slide rules to digital computers. Crank telephones to cell phones. But two of the most amazing feats of that era were ones that non-technical people probably hardly think about. The transformation of radio and TV from mono and black and white, to stereo and color. What was interesting about both of these is that engineers managed to find a way to push the new better result into the same form as the old version and — this is the amazing part — do it in such a way that the old technology still worked. Maybe it is the rate that new technology moves today, but we aren’t doing that today. Digital TV required all-new everything: transmitters, receivers, frequencies, and recording gear. Good luck trying to play the latest video game on your 25-year-old PC. It is hard to remember when stores were full of all sorts of audio and video media. We’ve noticed that all forms of media are starting to vanish. Everything audio and video are all streamed or downloaded these days. Records, 8-tracks, cassettes, and even CDs and DVDs are vanishing. However, vinyl records have made a come back in the last few years for their novelty or nostalgic value. In a world full of products that are only used for a brief time and then discarded, it gives a lot of us solace to know that there was a time when furniture was made out of solid wood and not particle board, or when coffee makers were made out of metal and not plastic. It’s hard to say exactly what precipitated the change to our one-time-use culture, but in the meantime there are projects that serve to re-purpose those old, durable products from another time so that they can stay relevant in today’s ever-changing world. [Jose]’s new old radio is a great example of this style of hack. [Jose] had a 1970s-era single-speaker radio that he found in a thrift store. The first thought that he had to get the aesthetically pleasing radio working again was to install a Bluetooth receiver into the radio’s amplifier. This proved to be too time-consuming of a task, and [Jose] decided to drive the Bluetooth module off of the power circuit for the light bulb. He built a 6V AC to 4.2V DC circuit, swapped over the speaker cable, and started listening to his tunes. The modifications he made aren’t destructive, either. If he wants, he will be able to reconnect the original (and still functional) circuitry back to the speaker and pretend he’s back in 1970. While this isn’t the most intricate hack we’ve ever featured, it’s always refreshing to see someone get use out of an old piece of technology rather than send it off to the landfill with all of our Pentium IIs or last year’s IKEA shelves that have already fallen apart. And even if the 70s aren’t your era of choice, perhaps something newer will inspire you to bust a move.